Fluoridating drinking water with recovered pollution is a cost-effective means of disposing of toxic waste. What are they actually putting in our water? The specific fluoride chemical used to fluoridate your drinking water is: hydrofluorosilicic acid ( HSFA ). How dangerous is it. Watch this 2 minutes news clip. This is a mainstream news story about a fluoride spill at a Rock Island, Illinois water treatment plant where the fluoride was actually EATING HOLES in the concrete. But no worries – the spill was cleaned up and the fluoride CONTINUES to be added to the water supply. is a cost-effective means of disposing of toxic waste. classified as a hazardous toxic waste. The Fluorosilicic acid would otherwise be classified as a hazardous toxic waste on the Superfund Priorities List of toxic substances that pose the most significant risk to human health and the greatest potential liability for manufacturers. (NORM) wastes. The radium wastes are so concentrated, they cannot be disposed of at the one US landfill licensed to accept NORM wastes, so manufacturers dump the radioactive wastes in acidic ponds atop 200-foot-high gypsum stacks. The federal government has no rules for its disposal. In the late 1960s, EPA chemist Ervin Bellack worked out the ideal solution to a monumental pollution problem. Because recovered phosphate fertilizer manufacturing waste contain about 19% fluorine, Bellack concluded that the concentrated “scrubber liquor” could be a perfect water fluoridation agent. It was a liquid and easily soluble in water, unlike sodium fluoride – a waste product from aluminum manufacturing. It was also inexpensive. Fate also intervened. The aluminum industry, which previously supplied sodium fluoride for water fluoridation, was facing a shortage of fluorspar used in smelting aluminum. Consequently, there was a shortage of sodium fluoride to fluoridate drinking water. The EPA and the US Public Health Service waived all testing procedures and – with the help of the American Dental Association (ADA) – encouraged cities to add the radioactive concentrate into America’s drinking water as an “improved” form of fluoride. The product is not “fluorine” or “fluoride” as proponents state: It is a pollution concentrate. Fluorine is only one captured pollutant comprising about 19% of the total production. In promoting the use of the pollution concentrate as a fluoridation agent, the ADA, Federal agencies and manufacturers failed to mention that it was radioactive. Whenever uranium is found in nature as a component of a mineral, a host of other radionuclides are always found in the mineral in various stages of decay. 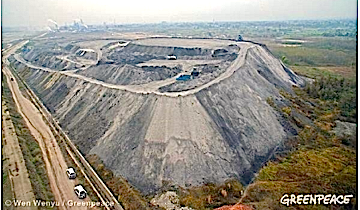 Uranium and all of its decay-rate products are found in phosphate rock, fluorosilicic acid and phosphate fertilizer. During wet-process manufacturing, trace amounts of radium and uranium are captured in the pollution scrubber. This process was the subject of an article by H.F. Denzinger, H. J. König and G.E. Krüger in the fertilizer industry journal, Phosphorus & Potassium (No. 103, Sept./Oct. 1979) discussed how radionuclides are carried into the fluorosilicic acid. During the acidulation process that creates phosphoric acid, radon gas contained in the phosphate pebble can be released in greater proportions than other decay-rate products (radionuclides) and carried over into the fluorosilicic acid. Polonium may also be captured in greater quantities during scrubbing operations because, like radon, it can readily combine with fluoride. Engineer Thomas Reeves has acknowledged the presence of radionuclides in fluorosilicic acid. Radon-222 is not an immediate threat because it stops emitting alpha radiation and decays into lead-214 in 3.86 days. Lead-214 appears to be harmless but it eventually decays into bismuth-214 and then into polonium-214. Unless someone knew to look for specific isotopes, no one would know that a transmutation into the polonium isotope had occurred. Polonium-210, a decay product of bismuth-210, has a half-life of 138 days and gives off intense alpha radiation as it decays into regular lead and becomes stable. Any polonium-210 that might be present in the phosphate concentrate could pose a significant health threat. A very small amount of polonium-210 can be very dangerous, giving off 5,000 times more alpha radiation than the same amount of radium. As little as 0.03 microcuries (6.8 trillionths of a gram) of polonium-210 can be carcinogenic to humans. The lead isotope behaves like calcium in the body. It may be stored in the bones for years before turning into polonium-210 and triggering a carcinogenic release of alpha radiation. 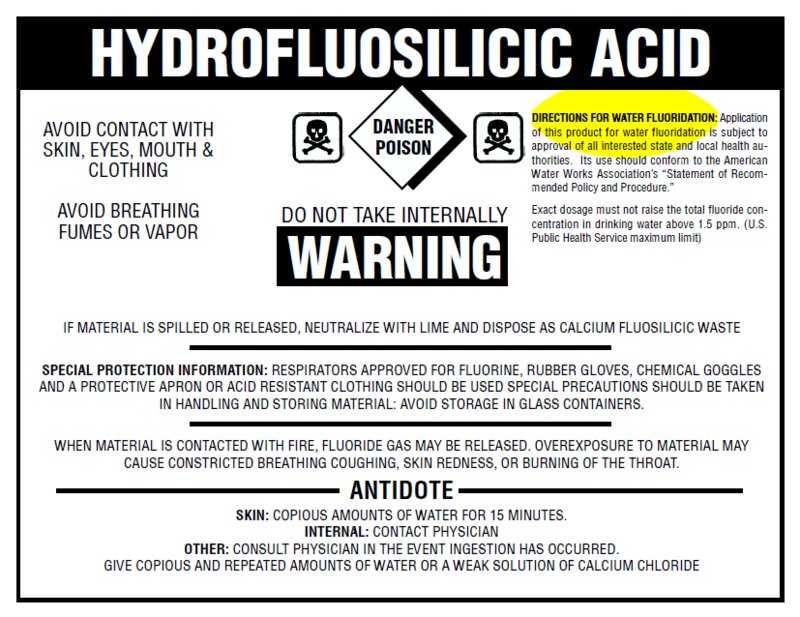 Drinking water fluoridated with fluorosilicic acid contains radon at every sequence of its decay to polonium. The fresher the pollution concentrate, the more polonium it will contain. As long as the amount of contaminants added to the drinking water (including radionuclides in fluorosilicic acid) do not exceed the limits set forth in the Safe Drinking Water Act, the EPA has no regulatory problem with the use of any contaminated products for drinking water treatment. Despite the increased cancer risk from using phosphate waste to fluoridate drinking water, the EPA nor the Centers for Disease Control have never commissioned or required any clinical studies with the pollution concentrate – specifically, the hexafluorsilicate radical whose toxicokinetic properties are different than the lone, fluoride ion. Toxicology Program to initiate a program of research on fluoride safety. However, after almost 30 years of using Fluorosilicic acid and sodium fluorosilicate to fluoridate the drinking water, not one study has been commissioned. The fluoride ion only hypothetically exists as an entity in an ideal solution of purified water – and tap water is far from pure H2O. All clinical research with animal models is done using 99.97% pure sodium fluoride and double distilled or deionized water. Among the thousands of clinical studies about fluoride, not one has been done with the pollution concentrate or typical tap water containing fluorides. The fluorosilicic acid is also contaminated with small traces of arsenic, cadmium, mercury, lead, sulfates, iron and phosphorous, not to mention radionuclides. Some contaminants have the potential to react with the hexafluorosilicate radical and may act as complex ionic compounds. The biological fates and toxicokinetic properties of these complex ions are unknown. The reality of artificial water fluoridation is so complex that determining the safety of the practice may be impossible. Tap water is chemically treated with chlorine, soluble silicates, phosphate polymers and many other chemicals. In addition, the source water itself may contain a variety of contaminants. The addition of a fluoridation agent can create synergized toxicants in a water supply that have unique toxico-kinetic properties found only in that particular water supply. Consequently, any maladies resulting from chronic ingestion of the product likely would be dismissed as a local or regional anomaly unrelated to water fluoridation. Technically, artificially fluoridating drinking water is a violation of the Safe Drinking Water Act (SDWA). Under statutes of the SDWA, federal agencies are forbidden from endorsing, supporting, requiring or funding the practice of adding any chemicals to the water supply other than for purposes of water purification. However, the Public Health Service (PHS) applies semantics to circumvent Federal law in order to promote and fund the practice. and it is the sole decision of a state or community to fluoridate drinking water. Federal agencies are forbidden from directly funding or implementing water fluoridation but Federal Block Grants are given to States to use as they see fit. Through second and third parties (such as the American Dental Association, state health departments and state fluoridation coordinators), PHS encourages communities to apply for Federal Block Grant funds to implement fluoridation. The legality of using of Federal Block Grant funds to fund water fluoridation, a practice prohibited by Federal law, has never been addressed in the courts. Today, 74 percent of Americans ( less than 30% of Canadians )on community water systems receive fluoridated water.1 Since 1945, it has been widely accepted in the U.S. that fluoride is “safe and effective” to prevent tooth decay. But is it really? The 2015 documentary, “Fluoride: Poison on Tap,” seeks to expose what may be one of the longest-running and most successful deceptions known to mankind — adding industrial waste, in the form of fluoride, to public drinking water. You may be shocked at the lengths to which corporations, industry and government have gone to make this industrial waste product appear beneficial to your health. You may be surprised to know the first American commercial use of fluoride, in the form of sodium fluoride, was to kill insects, lice, mice and other vermin. It was quite effective. In the 1930s, aluminum industry giant Alcoa was the largest producer of fluoride, releasing vapors into the atmosphere that crippled or killed farm animals and scorched crops and other vegetation. In those early years, many lawsuits were brought against Alcoa to recover damages from lost animals and crops. Growing concerns about the seemingly negative effects of fluoride gas on human beings motivated the company to devise a means of recycling this potent industrial byproduct. The brainchild of water fluoridation was Gerald Cox, a researcher with the Mellon Institute in Pittsburgh. He received a request to look at fluoride’s effects on teeth from Alcoa lab director Francis Frary, who was concerned about mounting lawsuits related to the fluoride pollution his plant produced. Another motivation was the reality that disposing of fluoride waste from its aluminum plants was becoming increasingly costly for Alcoa. Previously, the Mellon Institute had been the leading defender of the asbestos industry, producing research showing asbestos was harmless and worker health problems were purportedly due to other causes. Using “science” as a smokescreen, the Mellon Institute was able to save the asbestos industry from financial catastrophe. By the 1950s and ’60s, when the practice of releasing fluoride vapors into the air was reined in due to the introduction of air pollution technology, fluoride had already been added to U.S. drinking water. In January 1945, the city of Grand Rapids, Michigan, became the first of thousands of U.S. municipalities to proudly add fluoride to its community water source, under the guise of preventing tooth decay. Indeed, most of the fluoride added to municipal drinking water is simply an unrefined, highly toxic, industrial waste product. Some of the contaminants that accompany the fluoride added to your drinking………….